17 April 1894, Born in Kalinovka, Kursk Province. 1912-18, Worked as a metal fitter in the generator plants of the Ruchenkov and Pastukhov mines. 1919, Joined the Red Army and served as a soldier and party worker in the Ninth Rifle Division, attached to Budyennii's First Mounted Army. 1922, Began work in the Iuzovka Party organization. 1925-34, Rose through party ranks and elected to the Central Committee at the Seventeenth Party Congress in 1934. 1939, Made full member of Politburo. 1941-43, Served as a political commissar on various fronts during the war with the rank of lieutenant general. 1947, Accused of insufficient vigilance in stamping out nationalism in Ukraine. Relieved of position as First Secretary of Ukraine, although he retained his post of Chairman of the Ukrainian Soviet and his position on Politburo (Restored to full power in the Ukraine the following year). 1949, Made head of Moscow oblast and city committees and made Secretary of the Central Committee. Given control of agriculture and began to propose his "agrogorod" scheme. 22 March 1953, Became First Secretary of the party after Stalin's death. 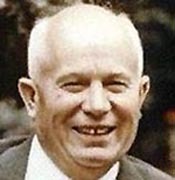 1955, Khrushchev consolidated power when Malenkov (because of participation in the "Leningrad Case") resigned as Chairman of the Council of Ministers. 1956, Secret Speech to 20th Party Congress that denounced the "cult of personality." 1957, Experiments began with the Machine Tractor Stations (MTS) and the decentralization of light industry with special regional economic councils (sovnarkhozy) set up. 1957, In June Malenkov, Molotov and Lazar Kaganovich orchestrated a Presidium vote to dismiss Khrushchev by a vote of 8-4 (Suslov, Furtseva and Mikoyan supported Khrushchev), but the Central Committee overturned the vote. Malenkov sent as director of a power station in a remote corner of Central Asia; Kaganovich made director of a cement factory in Sverdlovsk; and Molotov became ambassador to Mongolia. 1958, Assumed the role of chairman (Premier) of the Soviet of Ministers as well as party leader, forcing Bulganin to resign. 1960, U-2 spy plane piloted by F.Gary Powers shot down. September 1960, Addressed the U.N. General Assembly in New York. 1961, Met Kennedy in Vienna. April 1961, Iurii Gagarin became the first man in space. 1961, Stalin's body removed from Lenin's Mausoleum. 1962, Khrushchev ordered the publication of Aleksandr Solzhenitsyn's One Day In the Live of Ivan Denisovich. June 1962, Ordered the shooting of striking workers in Novocherkassk. Hundreds died with more executed and jailed. October 1962, Cuban missile crisis. August 1963, Nuclear test-ban treaty signed. October 1964, Deposed by Leonid Brezhnev, et al, in the Little October Revolution. There are some on the web (see my HIS 242 course and remarks on the "Thaw" in the Soviet Union under Khrushchev; I also have further biographical information there along with a more extensive list of web links). His 1956 Secret Speech denouncing the crimes of the Stalin era is available on the web, as is the article from Time Magazine naming Khrushchev the man of the year for 1957. When Vice President Richard Nixon visited the Moscow Fair with Khrushchev on 24 July 1959, they engaged in a famous kitchen debate about the pros and cons of communism and democracy.